Sledging can be done by both old and young alike, and is therefore very popular. Sledging is fun and always a create activity in the fresh air! Our holiday region offers several toboggan runs. 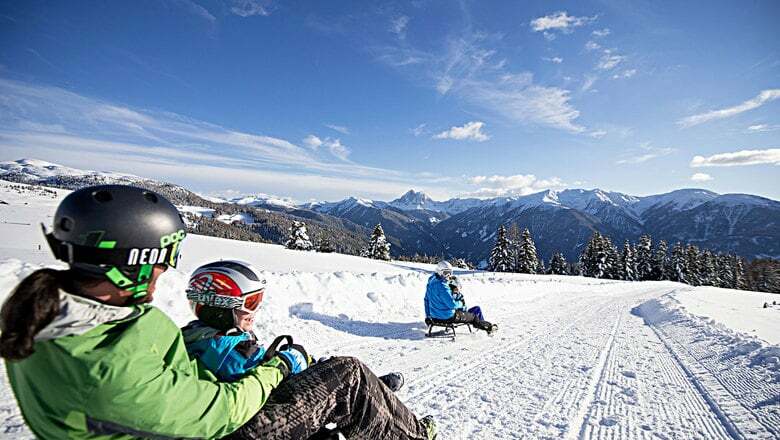 Sledges can be rented without charge in the hotel. We also have ski bobs available for children. From the Jochtal cable car valley station 1,5 km from the hotel, the "Schillingbahn" will bring you to the start of the sledge run. Enjoy a comfortable ascent by cable car and the easy 1-km-long toboggan run back down to the valley. If you have a ski pass, you can use the cable cars for free, otherwise you can purchase a special ticket for tobogganists. In the neighbouring village of Maranza, you can try a different toboggan run. It starts at the "Gitschberg" and leads down to the valley station of the cable cars. The track is 1.5 km long. The starting point can be comfortably reached with the cable cars. A ski pass is required to use the lift facilities.